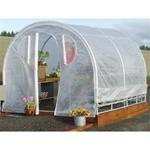 Home Greenhouses | Free Shipping and Handling! 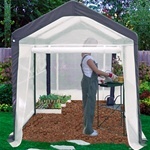 Home greenhouses are a large category of greenhouses, referring to anything smaller than a commercial greenhouse. 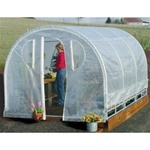 Home greenhouses are typically considered to be hobby greenhouses, for use by the home gardener. 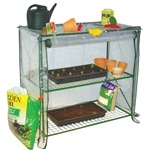 At Home Products 'N' More, we offer a wide selection of home greenhouses that you can assemble yourself. Some of the kits shown below are specifically for indoor use, while others are permanent structures designed for the outdoors. All the kits seen here are offered with free shipping and handling! 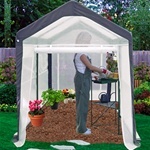 For more great gardening products, please visit our Patio, Lawn, & Garden category! There you'll find everything from outdoor furniture and garden arbors to landscape edging and raised bed gardening kits--everything you need to make your own outdoor oasis in your backyard. All products in Patio, Lawn, and Garden and throughout the rest of the store are offered with free shipping and handling, so order as much or as little as you like. The shipping and handling charges are on us! If you have questions about any of the products you see here, please feel free to call us toll free at 800-690-0132. We're available Monday through Friday from 7:00 am to 4:00 pm Central time, and we're always happy to help! Thank you for visiting!